Today I am sharing the Anniversary Card I made for my daughter’s 3rd wedding anniversary. I used a hand painted paper I made quite a while ago. I often hand paint in large batches & then can pull from my files anytime I want a special background. I believe this one was created with Easter egg dyes. You can buy the kits on clearance after the holiday. I used the tablets, dissolved in warm water & placed in a spray bottle. The stamp for this card is from an old Unity KOTM April 2014. 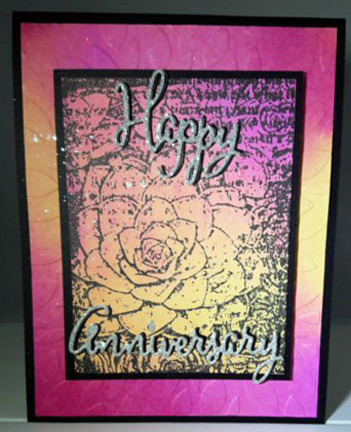 Sparkle is added with the glitter words & Fun Stampers Journey Sparkle Silk. It looks like it has spots but it’s the sparkle reflecting in the light. I have officially been posting now for 209 days on my Facebook page. Be sure to check out my other creative endeavors. There are a couple of sneak peeks of the new Bloom This Way catalog premiering Jan. 1st. But there is lots of fun before then. We are having a Black Friday – Cyber Monday special this weekend and in December stay tuned for the 12 Days of Deals. Click my shop now button to go shopping.